I grow mint in pots on my patio. Earlier this summer I spiffed up the planters from our old apartment with green outdoor paint I had leftover from my front porch remodel and garden landscaping project. I also took the opportunity to thin the root bound mint plants and transplant the peppermint and chocolate mint into their own little happy pot homes. Between transplanting and this summer’s drought the mint leaves are tough and do not taste as good as the mint I dried last year. I should wait and dry next summer’s mint for winter tea if I want to continue drinking mint tea that doesn’t make me gag. I’m not letting this summer’s mint go to waste. 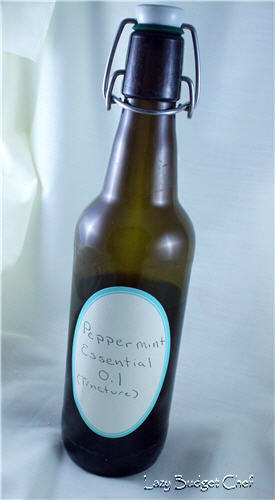 I’m going to make peppermint essential oil with my garden peppermint to use in my homemade shower cleaners. OK, technically, what I am making is not a pure peppermint essential oil. It is a peppermint tincture. To make an essential oil, you have to boil the herb in water, capture the steam, and cool the steam into a liquid to extract the oil. That’s why essential oils made with natural ingredients are often expensive (but so much better in quality than the cheap synthetics. Not to mention, synthetic essential oils usually contain pthalates which are bad for you.) 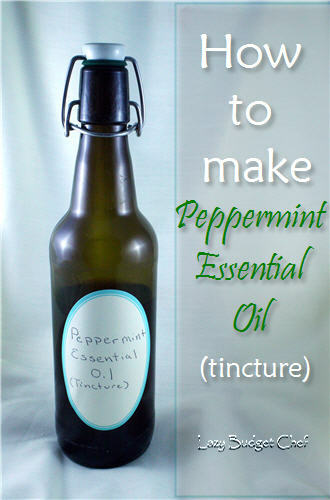 I'm calling it an essential oil in this post because that is what most people type into the almighty Google machine when they want to know how to make an herbal tincture. To make an herb tincture, you crush a dry herb to release the oil and allow the herb to soak in grain alcohol or vodka to release the oil. I add an extra step and evaporate the alcohol from the mixture as best I can. A tincture’s scent is less concentrated than an essential oil so you may need to use more of a tincture in a project that you would an essential oil. However, the upside is that tinctures are less expensive and easier to make. 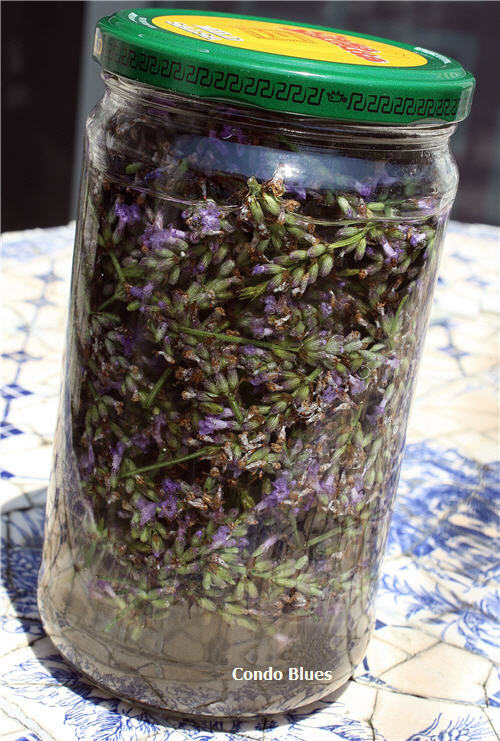 Generally I make tinctures of the herbs in my garden (lavender, mint, and from orange peels if we buy oranges) to use in homemade cleaning projects. I put the money I save toward buying pure essential oils I cannot make or have a project where I need to use a pure essential oil instead of a tincture. Dried peppermint leaves. Either use my tutorial How to Dry Herbs Without a Dehydrator or, if you don’t grow peppermint, you can order dried peppermint from Amazon for a good price. 1. Crush the peppermint leaves with your hands to release the oil. 2. Fill the jar with the tight fitting lid with the crushed peppermint leaves. The amount you use will depend upon the size of the jar and how much peppermint you have on hand. I have had success with completely filling the jar with herbs like the lavender shown here. I have also had success with filling the jar halfway like the dried orange peels shown here. How much you use depends upon how strong you want your tincture to be. 3. Cover the herbs in grain alcohol or vodka. Again, the amount of vodka you use will depend upon the size of your jar and if you want to make a lot or a little. I fill the jar to the top with vodka to make as much as I can. Warning: Do not use isopropyl/rubbing alcohol for this project. Isopropyl/rubbing alcohol has an extra odor that will not evaporate from the final tincture. Your essential oil will smell like rubbing alcohol instead of essential oil. Guess how I know? Phew! Don’t do it. It smells gross. Blah! Not to mention, if you drink it you’ll go blind. Yikes! 4. 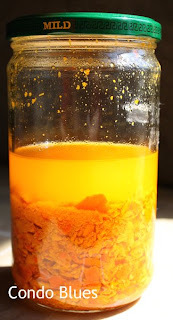 Shake the jar to release the oil several times a day for three days. The longer you let the peppermint steep the stronger the peppermint oil you will extract. I let mine sit in a sunny spot on my kitchen counter for a weekend. Tip: Depending upon how humid it is where you live, if you let the herbs steep longer than three days the herbs in your tincture may start to mold and ruin the project. For this reason, I let my herbs steep for three days tops. 5. Use a coffee filter to strain the liquid from the mint and into the second jar. Congratulations! You made peppermint flavored vodka! 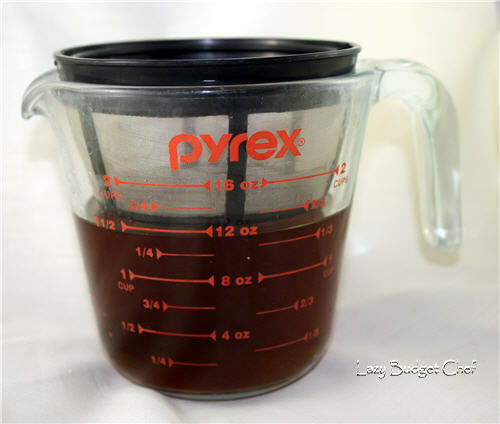 If I am running low on extra jars, I use an old reuseable coffee filter to strain the tincture into a measuring cup so I can wash and reuse the original jar. Caution: Since I pack the jar full of mint my vodka is too minty strong to drink. Not big deal since I use my tinctures for cleaning and crafty things, not for drinks. To further discourage me from drinking my tinctures I use cheaploa vodka, which tastes wrenched. If you want to make an herbal tincture for drinking or food purposes, use less peppermint and the best tasting vodka you can afford. 6. Place a clean coffee filter or cloth on top of the jar of liquid and let it sit undisturbed to allow the alcohol to evaporate from the jar. I let my jar sit for one week. 7. Optional. Sometimes I find sediment in the bottom of my jar of peppermint essential oil after one week. I strain the peppermint tincture through a coffee filter a second time into my lidded storage jar. An amber colored jar such as a repurposed yeast jar, wine bottle, or olive oil bottle will keep sunlight from degrading the essential oil. Ta Da! Ready to scent my DIY daily shower cleaner. Psst...look at step five, you've got lavendar buds used in it. I add herbs to my oils for soap making but I need to start making tinctures - thanks for the great tutorial!